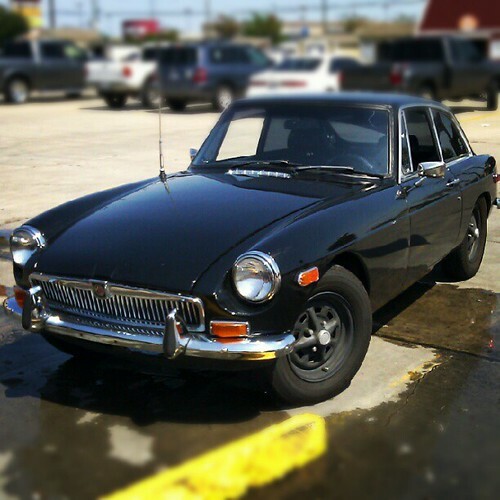 Nicholas spotted this gorgeous pristine 1974 MG at the local hardware shop over the weekend. He chatted up the owner and listened to the story of this beloved car. Old cars are wonderful. They have that faint petrol and oil smell that reminds me of my dad's old Datsun and my old Alfa Romeo. The smell reminds me of riding shot-gun in the Datsun, looking down through the gear shift boot and seeing the pavement below. Good times. So, I'm the sentimental one in the family. I tend to hold on to old things. For me they hold old memories and tell stories. I like stories. This Pentax set has probably captured many stories in its lifetime. My manager at a previous job bought this set while on a military tour in Japan. For the past few decades, it was packed away having been replaced by larger digital cameras. He found it on his recent move and knowing my love of photography, he gifted it to me. Possibly one of my most prized gifts. I've taken it apart and tried to give it a good cleaning. 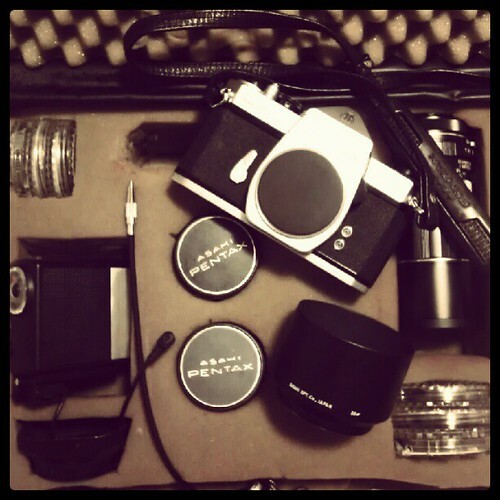 I also adopted a long forgotten drawer of 35mm film to use in it as well. I've been inspired by this past summer's #filmsnotdead theme to take more film photos. There's a different feel when you take the time to compose a photo for a film camera. Technology is great, but sometimes I like to play with old school. This little beauty is my recent old school find. 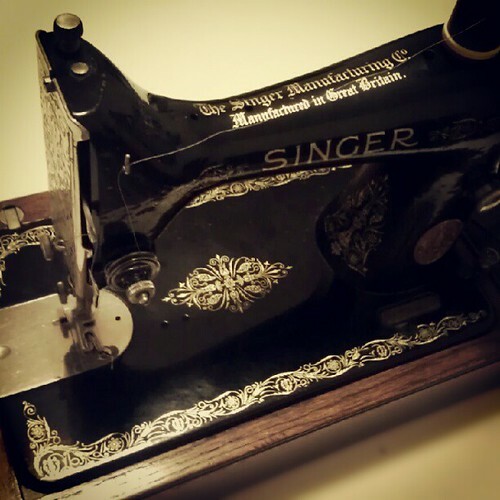 It's a 3/4 sized sewing machine made by Singer called a 99k. The "k" according to the internet means it was made in Scotland's Kilbowie Singer Factor. This one is handcranked. It could be fitted with a motor, foot pedal and light, but I really like the idea of cranking it by hand. (Less chance of sewing myself to a piece of fabric.) This one, like the old cars, has a particular old oil smell. I wonder what she made back in the day. My mom used to make my clothes and pillows on her sewing machine. So far I've managed to conduct corrective surgery on the pugs' stuffed toy collection and made two pug beds. I have grand plans for decorative pillow cases, pug luchador masks, and my own clothing designs.